I got an opportunity to listen to Gyanesh Pandey, CEO of Husk Power Systems in IIM Bangalore last month. I don’t know why but I find the HPS story of producing Bijli from Bhoosa (electricity from husk) fascinating. And listening to the story from Gyanesh increased my fascination even further. Based out of Bihar, HPS is doing to eradicate needless darkness in rural India what Aravind Eye Hospital has done for eradicating needless blindness. It has so far electrified 450 villages / hamlets (mostly off-grid) in Bihar & UP. I have tried to condense the narrative below by keeping Gyanesh’s language as much as possible. You can find the fuller version of the story here. I grew up hating my place (in North Bihar). Nothing made sense to me. Every single thing in the village costs you a little more, quality is poorer and people are lethargic. During holidays, I reluctantly came home from the boarding school. I tried to find reasons for not coming home. I could feel the depression all around. I ended up becoming an engineer and going to the US for higher studies. During my PhD I came home to attend my sister’s wedding. On one of those evenings with the extended family members I was telling them stories of America. Naively I ended up saying, “It’s hard to tell you guys – You can’t even dream of how it is (in the US)”. I didn’t mean to offend anyone. However, an old guy in the room said, “For us, it will always be a dream. Because people like you will always maintain a distance from us.” I don’t know what he meant, but his words resonated somehow somewhere with me. This was 2001. I automatically assumed that something is not being done because technology for doing it doesn’t exist. This was a big mistake. For the next 5 years, I partnered with Ratnesh Yahav, my best friend from childhood and experimented with several leading edge technologies like polymer solar cells, fuel cells, micro-tidal energy and finally Jatropha based bio-diesel. All of them failed. By 2006 I was back to Bihar from the US and badly depressed after the Jatropha project failure. At this point, I got an appointment to see a director at the Renewable Energy Development Agency. He asked me, “How are you going to electrify villages?” I said, “I don’t know. I will do something”. He hit a buzzer and called the peon. “Call the guy who just left the room” Then he told me, “Talk to him. He sells gasifiers. Why don’t you use something like that?” I knew biomass gasification was an old technology developed by Hitler for wartime. People don’t use it anymore. The dealer told me that there were 40 gasifiers being used in Bihar. I said, “Wow!” He thought I am an NRI and he was trying to sell gasifiers to me. I started by finding out all I could on gasification based power generation. I found a paper from IISc and it said you can’t run an engine only on producer gas. Gasification is where you burn a biomass that generates a certain mixture of carbon monoxide and nitrogen and that mixture is combustible and becomes fuel. IIT Delhi had done a project. However, I couldn’t find a single instance where anybody said, “It has worked”. I tried to talk to a professor and he wasn’t even willing to talk to me. I just knew that all these people are wrong. I had no reason why. At this point a scientist from MNRE, Mr. S K Singh encouraged me. Singh helped getting me hooked with a small engine maker from Agra. This was in June 2007. By August 15, 2007 we had a working system. We had electrified our first village. Soon after this we put out 2 systems electrifying 5 villages. By then we were out of money. How did Gyanesh-Ratnesh manage to raise money? How does HPS business model work? How did they do the pricing? You can find the full story here. In photo: Prof. Abhoy Ojha of IIMB (left) along with Gyanesh Pandey. I got an opportunity to listen to Mr. L. R. Natarajan (LRN), head of innovation council at Titan and Chief Manufacturing Officer of Tanishq, Titan’s jewelry division. He was one of the guest speakers at our workshop on innovation management at IIM Bangalore. The first thing you notice about LRN is the passion he carries for building a culture of innovation. After listening to the seven year journey LRN presented, most of us felt, “There is a lot more we can do in my organization”. What kinds of innovation management practices are followed at Tanishq? Here is a short summary. “What’s new” campaign (2004): The journey at Tanishq began in 2004 where each of the 14 manufacturing departments was given a structured white board. Each team was supposed to write “What’s new” they are attempting on the whiteboard given to them. Competitive spirit was created by defining a review process and attaching rewards. This simple and effective process is still active after seven years of its launch. Dreaming workshop & HOD fund (2006): In 2006, Titan had a workshop called “future shock” in which the MD asked 600 managers to dream about “Where do you see Titan 5 years down the road?” More than 130 new business ideas were generated. Through a selection process they were narrowed down to 2 new brands to be launched: Goldplus and Eyeplus. “HOD fund” was initiated after observing that purchase of any capital item goes through a long chain of approvals – Sr. Manager, Deputy GM, GM, VP, COO, Corporate finance, Corp purchase & finally MD. By then the person who initiated the process loses interest. HOD fund created a shorter route for innovative ideas. Each Head of the Dept (HOD) was given a budget of upto Rs. 1 Lakh which he can approve himself. Innovation school of management (2008): Between 2004 and 2008, many ideas got implemented. However, a closer look revealed that ideas had come from only 10% of the employees. Innovation school of management was started to involve every employee in this journey. A six month course was created and a written test & viva were conducted to select the first batch of 30 participants. For the first 3 days, the participants are taught about what, why and tools and techniques on how to think creatively. Then they were given a challenge to work on. If the inventory is 1 crore the challenge could be “How can we manage with 10 lakh inventory?” All HODs are trained mentors and they mentor the participants. Each participant is given 6 hrs per week to work on the challenge. There is a review once a month. At the end of the course, the MD hands over the certificates. The goal is to have all the employees as trained innovators by 2014-15. So far 187 out of 400 employees in the factory have been certified through the school. Currently innovation group in Tanishq has 9 full-time members with 1 division manager, 3 managers and 5 executives. 1. Diamond setting: The process for preparing the casting mould was improved so that a highly skilled job of diamond setting becomes easier. In place of 100 to 150 stones a karigar is now setting 1500 stones every day. This process improvement idea has been patented. 2. Diamond bagging: Diamond bagging is a process of starting with a work order, picking the right set of diamonds from hundred different varieties, putting it in a bag and giving it to the production to put it in the necklace. The idea of automating this process came from the theme that was launched in 2007: “Simplify and automate”. After about 4 years of working closely with the machine building division, a robotic arm was created that automated diamond bagging. This may be first time diamond bagging got automated in the world. 3. Gold out of stone: Hard silicon carbide crucibles were lying around the factory. People knew that these might contain gold. However, people didn’t know what to do. One day, Rajsekhar, one of the operators got a road-roller from his neighbor and crushed the crucibles. About four and a half kilos of gold was recovered. Three of us (Prof. Rishikesha T. Krishnan, Prof. S. Rajeev and I) facilitated a three day Executive Development Program at IIM Bangalore last month titled “Going beyond jugaad: Building a systematic innovation capability”. 22 executives from 12 organizations participated in the workshop. On the third & last day, one representative from each organization presented their current practices for managing innovation as well as areas they would like to improve upon based on the learning at the program. Here is an attempt to summarize their perspective (not meant to be exhaustive and limited by what I captured in my notes). Before we look at how different organizations are managing innovation in India, it makes sense to see participant and company profiles. The 12 companies represented following sectors: Aircraft manufacturing (India center), Automotive manufacturing, Consulting, India centers of high-tech products, IT services, IT enabled services (BPO) & Media (leading FM radio channel). Titles of the executives varied from CTO, DGM Innovation cell, VP New business / Marketing, Group Manager, Sr. Development Manager, Mobile Architect, Technical Fellow, Senior Staff Engineer etc. All the participants were very serious and active players in the innovation initiatives in their respective organizations. Let me classify their perspectives into 3 key areas: idea management, buzz creation and learning & development. 1. Idea management: Almost all the participating organizations had a system in place for managing ideas. What varied was the scope of the innovation. In some organizations there was a bias for the IP (patent) management. In some cases the global process for big ideas was very active. However, the contribution from India center was low. In some places the system was active only in some part of the organization and in a few places the existing approach was primarily top-down. Key takeaways: Encourage small ideas, implement bottom-up approach, create a challenge book (problem focus), make the measurement system more robust, improve the idea velocity, use cross functional teams. A couple of executives said their focus would be large impact idea creation using strategy models. 2. 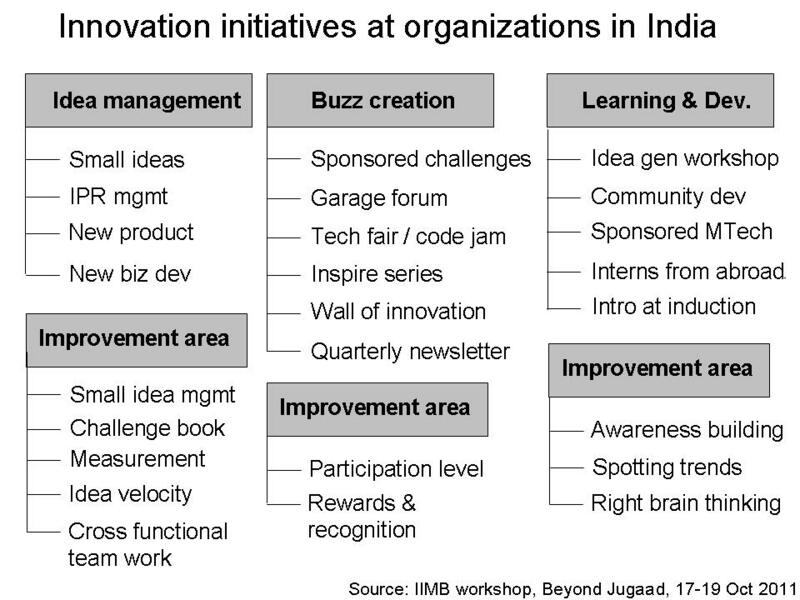 Buzz creation: Many organizations had events such as sponsored challenge or bright idea campaign to generate ideas and buzz around innovation. In some cases these events generated several hundred ideas every year. Garage forums encourage prototyping, Tech fair creates a platform for technical paper presentation, Inspire series invites external speakers, Wall of innovation displays innovators, Quarterly newsletter raises awareness on innovations inside and outside the organization. Key takeaways: Almost all executives felt that they need to improve the participation level. Some said they need to improve the reward and recognition system. 3. 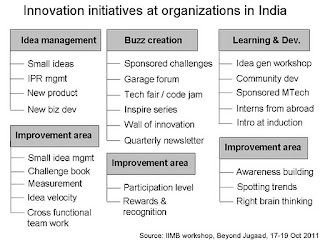 Learning & development: For educating employees on innovation, organizations conduct idea generation workshops using methodologies such as design thinking, encourage informal communities for knowledge sharing, sponsor MTech/PhD and introduce innovation during company induction program. Key takeways: More awareness building, Spot new trends in a structured manner, Inculcate right brain thinking. 12 organizations is a small sample. However, we hope that the seriousness demonstrated by the executives spreads in their organizations and beyond. Let’s build a culture of innovation systematically!